Austin — The Texas Community Music Festival roared into the home stretch with stellar performances both Monday and Tuesday nights, before record TCMF crowds! Monday’s show featured a soulful performance by Candace Bellamy and her R&B ensemble on the patio. The seventeen piece Austin Mandolin Orchestra plucked and strummed their way through a wonderfully diverse setlist and then the packed Cafe audience was completely blown away by an innovative and beautiful performance by the young, talented One Ounce Opera. As the evening went on, you’d expect the audience to begin to filter out, but Monday night, it grew, grew and GREW! Had Central Market stayed open past nine, the crowd would still be there. Tuesday’s performance began with a sentimental farewell performers by TCMF veterans, the 145s, who were playing their swansong before friends, families and a large appreciative audience before moving on to new musical endeavors. We’ll miss them at TCMF but are sure they’ll be back in one form or another very soon. 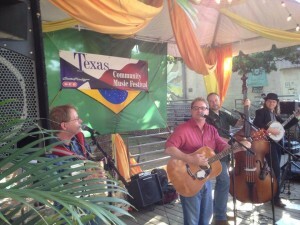 The evening, and the Central Market portion of the Eighth Annual Texas Community Music Festival concluded with a performance by Them Blue Skies, a 5 and a half piece blues band featuring TCMF coordinator Kathleen Brotherton on vocals and lead guitar. It was an upbeat, “downhearted” ending to a record-setting two weeks at Central Market. TCMF wishes to express its sincerest thanks to Central Market, events coordinator Sean Hopper, TCMF sound engineer Joey Christopher and ALL the outstanding volunteers from the Austin Civic Wind Ensemble (and other groups) who made this year’s festival the best yet. “TCMF 8.0” officially closes tonight, Wednesday, at the Farmer’s Market at the Triangle, with a performance by MT Hellton at 6:00, followed by the Austin Polka Band, who will be playing at the Flying Saucer Pub at 7:30.